Cornwall, with its remote coves and rugged landscape, is a mysterious and beautiful place to visit and a trip to the Barbara Hepworth Museum and Sculpture Garden will make your visit complete. In this carefully designed garden there are many of this artist’s amazing and beautiful sculptures that will keep you intrigued for many hours. Some of the statues are enormous and the garden itself is surely the best setting for them. Hepworth herself commented about the amazing natural light in Cornwall and this is particularly effective to enhance the bronze statues. Many are still where the artist positioned them, so you will see that the garden itself blends with the statues to create a very impressive work of art. But there is more to see. 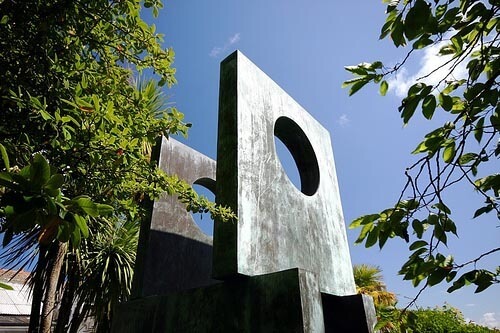 You will find the house very interesting as there are a wealth of Hepworth’s paintings and drawings inside. When you visit this house and garden you will find it easy to realize why this artist loved it. She moved there just before the Second World War and this setting inspired her to create many of her largest and most spectacular works. She died in 1975 and the Tate St. Ives Gallery are now committed to keeping her garden and house as she wanted it. Allow yourself plenty of time to dwell as there are so many wonderful works of art to see. Last updated by Mary Charman-Smith on 07 September, 2011 in Destinations.